Sharpe’s resignation followed acting General Services Administration chief Tim Horne’s announcement that the agency’s newly stood-up Technology Transformation Service would move into the Federal Acquisition Service as part of President Trump’s efforts to streamline information technology acquisition. 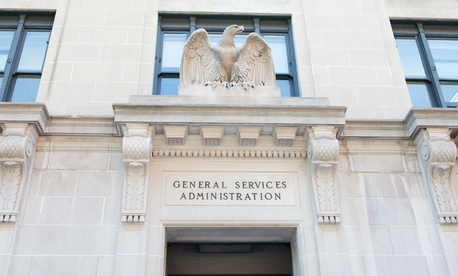 Horne during Monday’s ceremony at GSA headquarters’ “historic administrative suite” acknowledged the three previous FAS commissioners—Sharpe, Steve Kemp and Jim Williams—since the unit was created in 2005 via a merger of the Federal Supply Service and the Federal Technology Service. Horne exulted that – after six months on the job at a desk that sits alongside others in the agency’s open-office bullpen – he finally got to use the high-ceilinged wood-paneled room that was built a century ago for powerful Interior secretaries (and where the 1920s Teapot Dome oil royalties bribery scandal was said to have originated) for the swearing in. Having “checked that box on the application,” as Thomas joked, the new commissioner comes with 20 years of both federal and industry experience. He led a small technology company contracting in the federal market through GSA’s Schedule 70 for IT products and services, managed profit and loss for an Alliant Small Business prime contract holder, and used GSA procurement vehicles as a government program manager, according to a GSA statement. Thomas also worked for the Office of the Undersecretary of Defense for Acquisition, Technology and Logistics, and as an Army management analyst. The new leader at FAS arrived just after the story broke on Friday that predecessor Sharpe had been vindicated by the GSA inspector general for an earlier complaint of having been retaliated against by departed GSA Administrator Denise Turner Roth. Sharpe had blown the whistle on what he saw as problems with Roth’s changes to FAS. Sharpe’s main issue was the allegedly improper move of the fee-based multi-billion-dollar Acquisition Services Fund to the Technology Transformation Service, according to the news report, a fund that FAS traditionally controlled. The inspector general referred the findings to the Office of Special Counsel. The Trump team now at GSA declined to comment.